UPDATE 11/19/13 – The body of Derrick has been found in the water off of Marina in San Leandro on Friday. Derrick Shao, 20 was last seen at about 10 a.m. Thursday in the 900 block of Ingerson Avenue in the city’s Bayview District on Nov. 7. He was heading out to catch the 29-Sunset Muni bus to the school, according to police. Derrick never made it to school and has not been in contact with family or friends since. 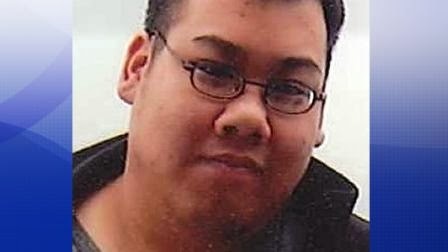 Derrick is described as Asian, about 5′ 10″ tall and 185 pounds, with brown eyes and black hair. He was last seen wearing black-rimmed glasses, a dark blue North Face pullover jacket, dark jeans, and red, black and white Nike shoes, police said. He was carrying a black JanSport backpack. Anyone with information about Shao’s whereabouts is asked to call the Police Department’s operations center at (415) 553-1071 or the Bayview Station at (415) 671-2300.